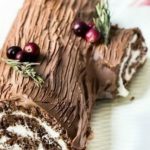 A Buche de Noel yule log cake that is both low carb and gluten free. So delicious, holiday guests will never know it’s a sugar free low carb dessert! Preheat the oven to 375 °F (175 °C). Line a baking sheet or jelly roll pan with parchment paper. Combine the coconut flour, psyllium husk powder, cocoa powder and the baking powder in a small bowl. Mix well until there are no lumps. You can also sift the mixture. Combine the egg yolks, whole eggs, cream and the Sukrin in a large bowl. Beat with an electric mixer until smooth. Add the coconut flour mixture and beat until smooth. Fold in the egg whites and stir carefully until smooth. Spread the batter on the baking sheet or the jelly roll pan lined with parchment paper into a 1/2-inch (1.2 cm) thick rectangular-shaped layer. Bake in the preheated oven for 10 minutes, or until just done. Don’t overbake, otherwise the cake will crack when you roll it. Remove the cake from the oven. Cover the cake with parchment paper and place a wet tea towel on it. Place another baking sheet over the wet towel. Invert the baking sheets, holding them well together as you turn them. Remove the topmost baking sheet and carefully peel away the parchment paper. Gently place the parchment paper again on the cake. Cover with the wet tea towel. Allow to cool completely. While cooling, prepare the filling. Prepare the filling: Add the coffee granules to the heavy cream. Whip the cream and coffee mixture until stiff peaks form. Set aside. Place the mascarpone and the Sukrin Melis in a medium bowl. Beat with an electric mixer until fluffy. Fold in the coffee-flavored whipped cream and mix gently with a rubber spatula, until smooth. Spread the filling evenly on the cooled cake. Leave 1/2 inch (1.2 cm) from the edges without filling. Carefully roll the cake into a tight cylinder with help of parchment paper. Wrap tightly in tea towel. Refrigerate for 2 hours. Prepare the frosting: Melt the chocolate in a microwave oven or in water bath. Add the orange peel, mix well and let cool down so that the chocolate is lukewarm. Place the cream cheese, butter, orange essential oil and the Sukrin Melis in a medium bowl. Beat with electric mixer until smooth and fluffy. Pour in the melted chocolate mixture and mix with a rubber spatula until smooth. Remove the cake roll from the parchment paper. Frost with the chocolate frosting. If the frosting is too stiff, heat it in the microwave oven for a few seconds. After frosting the cake, streak the surface with a fork or rubber spatula to resemble bark. You can cut off the ends and place them on the cake roll as protruding stumps. Add other decorations if you wish. Serve, and store the leftovers in the fridge. The Low-Carb Buche de Noel tastes best on the next day.